Chelsea Football club defeated Tottenham Hotspur 4-2 on penalties at Stamford Bridge in the Carabao Cup semifinal on Thursday night to set up a clash with holders Manchester City in the final. Before coming in today’s game, The Blues trialled Spurs 1-0 from the first leg at Wembley but midfielders N’Golo Kante (27 minutes) and Eden Hazard (38 minutes) put Chelsea 2-0 up on the night after a dominant first half. However, Spurs came back firing in the second half with Fernando Llorente drawing them level on a 2-2 aggregate on the 50th minute. 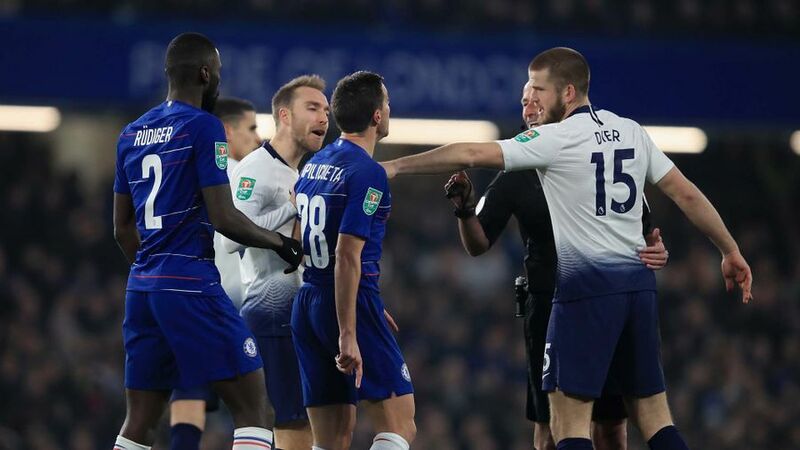 With no extra time, Naija News reports that the game went straight to a penalty shootout with Eric Dier, who scored the winner for England in their penalty shootout against Colombia, blazing over with his penalty kick. Similarly, Lucas Moura saw his spot-kick saved by Chelsea’s goalkeeper, Kepa Arrizabalaga with Tottenham’s very next attempt. The development meant Chelsea Brazilian defender that David Luiz was able to step up and slot home the winning penalty to put Maurizio Sarri’s men through to the final.